From my “Ask me Anything!” newsletter e-mail I got a lot of questions from you about how to stop comparing yourself to others. So as promised, I’m going to take this opportunity to answer your questions here on the blog, so others can benefit from it as well. I always keep on comparing myself to others who are doing well and feel so discouraged. What do you think I should do? Ok, so first of all: You are not alone. Jealousy of others (Envy) is a very common personal issue and a lot of people are struggling with it. I experience it in my larger circles of friends a lot and it’s always a little difficult to handle, for both sides involved. I believe at the core of comparing lies the fear of inferiority. Feeling inferior or inadequate is really hard to tolerate, so we do anything to check if there is a slight chance of being inadequate. This need to validate yourself leads to comparing, in the hope to come to the conclusion that you are ok. Then you know that you are enough. The need to be better may be healthy competition, but more likely it also stems from the inability to accept that someone else is better. If you are comparing this would mean the other person is superior to you, and therefore you are inferior. But all this is inner confusion coming from not being centered. What does that mean? It means that you realize on a deep level that you can’t possibly be inferior. You are a unique human individual and have the same essential rights as everybody else. Ultimately there is no such thing as inferiority or superiority. Everyone who tries to tell you otherwise is just ridiculous and has just disqualified him-/herself. You just need to recognize this truth inside of yourself and trust yourself on it. Your true nature is not defined nor touched by these little aspects over which you used to compare yourself with others. If you are really lost in the habit of comparing yourself all the time, the first thing you want to do is to break your state. Change both your physical (maybe take a walk or run) and mental state. Force yourself to focus your mind on something else. 1. What is Right for You? In order to break out of the cycle of comparing and envy, you need to focus on yourself again. You need to find your own strengths and build on those. Center yourself around what is right for you. What fulfills you and makes you happy? What are your personal goals? How can you grow? Where do you excel and shine as a human being? Then you create your own compass to guide you. You don’t need any external approval anymore, because you can give this to yourself by fulfilling your own high standards. If you start living on your own terms like this, you develop this inner strength and comparing yourself won’t feel even necessary any more. Look at the sides of yourself which you are already proud of. What did you do right? Where did you get complimented on? From there you can easily find ways to focus on what is great about you and then build on top of it. Truly wealthy is not who has all the things but who is content with what she/he has. The emotion of gratitude makes room for new things to come into your life. On the other hand the emotion of jealousy is pushing things away from you. That doesn’t mean that you will suppress your desire to get ahead. But you want to appreciate what you already have. Besides that, having a lot of things is not that desirable in the first place. Simplify your life to become more content. Sometimes I see that people almost neglect parts of their live because they think that they are not good at it. This may be true to your looks, your intellect, your ambitions and general abilities. You have to bring up the courage to put your best foot forward and to develop your own, individual potential. If you never try and exercise a specific part of yourself, this only would confirm your limiting beliefs about it, instead of developing this part at your own pace. Almost everything can change and sometimes it’s just the act of allowing yourself to change. The moment you start, you’ll probably discover that in fact the reality looks much better than you thought it to be. Use jealousy for yourself to grow. Don’t channel it against the other person and then feel bad about yourself. The one thing that you should not do is to mitigate and then use this “acceptance of who you are” as an excuse not to work on yourself. This is a danger and there is a fine line here. Instead of saying this is who I am and then feeling bad about it, think about where you want to be and start to grow into this direction. Jealousy only happens if you buy into the idea that you can’t change anything. So get inspired and go. Of course you will encounter people who are better than you are. This is life. It only gets difficult when you channel this experience into this emotion called jealousy, because you instantly fear feeling inferior. But you don’t have to. You have a choice. You can also just enjoy that someone else is doing great too. A mature human being is able to acknowledge the successes of others and even enjoy them. If you follow your own goals and successes and do the best you can to – for yourself – then this is giving you the basis for inner contentment. Then you can shine and let others shine too. So in summary, you have several good options to deal with jealousy if it arises in you. You can stop comparing yourself to others by practicing the 4 points from above. And you can especially end this validation seeking by understanding that at your core you are already perfect as you are. This encourages you to just life your own life, and not look at what others are doing. What Are Your Most Common Emotions? I think if you are self aware about your self then you will never compare your self with others. Self awared people knows the the positive points and negative points in themselves. I have just tries PRISM Brain Map’s self awareness tool. Due to this I got to know all of Mine strong points. This is a great article, coming from someone who is caught in the cycle of comparing and jealousy. Thank you. Fabulous post, I really needed to hear this – thank you for writing out such a reasoned, detailed and step by step self-help guide to freeing ourselves from thoughts of jealousy – so helpful!! 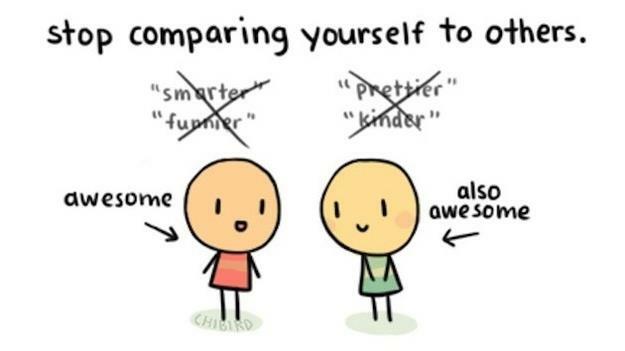 : ) I feel much more confident and positive about my self-worth after reading this! Well thats a nice analogy Wan Muhammad Zulfikri. As I said, you can either use the fact that there are better people than you are right now as 1) an inspiration or 2) transcend it all together (as your analogy suggests). Once, I had this idea about jealousy. It’s something I call ‘the totem pole’ mentality. Whenever people find themselves that their ‘head’ on the totem pole is positioned lower than others, they’ll always have thoughts that they will feel bad about themselves. If they were to climb the totem pole thus becoming the highest ‘head’ of the totem pole, they’ll feel good about themselves. But the thing is “So what?”. The thing is there’s only one thing that we can be sure that will stay with us for a long time. It’s the totem pole of ‘ourself’ that we need to climb because we need to be the best in being ourself. Haha I think that’s a perspective of mine on jealousy generated from doodling in college. Thanks for the post, Myrko. Thanks a lot! This post is really helping me. I’m in final year of my college. Though I’m from a reputed institute, I haven’t got a job offer. Most of my fellow mates have got offers from different organizations and companies. This gave birth to a feeling of envy and jealousy in me. I never felt jealous of anyone in my life before all this. I’m going through a tough phase. I am average at studies. When I entered the college, I came here as a rank opener an now I’ve become an average student. The problem is that most of the guys who are below average have landed to decent jobs in their respective branches. The problem is that I too could ‘ve got an offer but I’m not trying to get into fields like finance and IT. I want a job in engineering core company. And they are not visiting our campus, the reason being financial crisis and all. All I’m doing is waiting and having patience. Hope, something good happens to me. Amazing, thank you, I think jealousy it’s just a lack of self confidence mixed with the feeling of possession, once again the answer it’s in ourselves. @Charles Ndisya: You’re most welcome Charles! Thanks a lot for this information. The four points about how to stop comparing to others has taught me so much. it’s clearly now that so much has been happening inside of me without realisation. What you’ve written here is so true and it involves what’s happening in our daily life.